It’s another week of the National Football League schedule, and another Throwback Thursday feature. 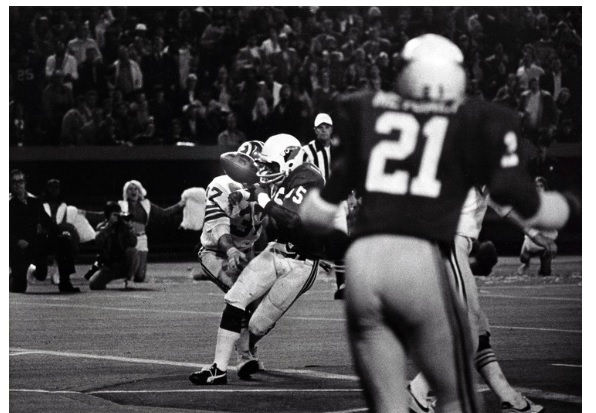 This week, the Washington Redskins face the Arizona Cardinals, and our TBT will highlight a game played on November 16, 1975 between these two teams. The Cardinals were based in St. Louis at the time and both clubs were members of the league’s NFC East division. They entered this contest fighting for the division lead with identical 6-2 records. A defensive struggle produced a scoreless first quarter, then St. Louis’ Jim Bakken hit a short field goal to give his team the lead. Redskin quarterback Randy Johnson, a journeyman veteran filling in for regular signal caller Bill Kilmer, hit on a pair of touchdown passes, to Charley Taylor and Mike Thomas, to give Washington a 14-3 lead. The Cardinals pulled to within 14-10 when Jim Hart hit J.V. Cain on an 8 yard scoring toss, but Mike Moseley extended the ‘Skins’ lead to 17-10 with a field goal. Later in the fourth quarter, Hart led his team down the field attempting to tie the game, and reached Washington’s 6 yard line. He then proceeded to toss 3 consecutive incompletions, setting up what would be one of the most controversial plays in Redskin history. 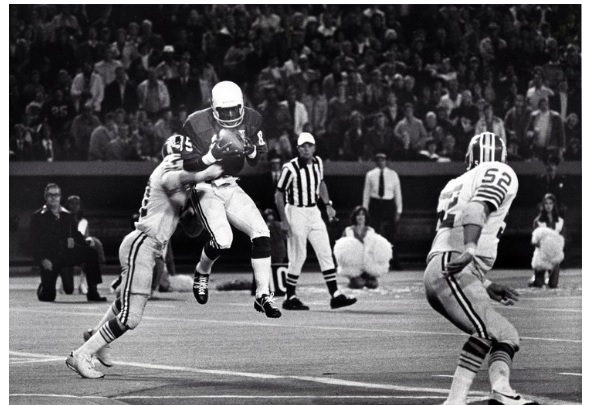 He fired a pass to his favorite target, Mel Gray, who clutched the ball in the end zone as he was being hit simultaneously by Redskin cornerback Pat Fischer. The ball popped out and hit the ground, and while one official ruled it incomplete, another called it a touchdown. After a huddle among the zebras, the play was ruled a touchdown. Bakken’s extra point tied the game, and the Cardinal kicker won it in overtime, 20-17, with another field goal. Fischer, a former Cardinal, protested the call and insisted the pass was never caught. Gray even put his hands on his helmet in frustration, thinking it was an incompletion. There was no replay review in those days, so the officials’ call on the field was gospel. One thing is certain – there is no way, under today’s rules, that the pass would be anything but an incompletion, as a receiver is required to hold onto the ball and make a “football move” to complete the catch. The game knocked coach George Allen’s Washington team out of first place, and they never recovered, falling to an 8-6 final record which kept them out of the playoffs. St. Louis used the victory as a springboard to their second consecutive NFC East title.